Granta 135 is a snapshot of contemporary Ireland, which shows where one of the world’s most distinguished and independent literary traditions is today. Here international stars rub shoulders with a new generation of talent from a country which keeps producing exceptional writers. This issue features Lucy Caldwell imagining forbidden first love in Belfast; Kevin Barry on Cork, ‘as intimate and homicidal as a little Marseille’; an exclusive extract of Colm Tóibín’s next novel, about growing up in the shadow of a famous father; fiction from Emma Donaghue about Victorian Ireland’s miraculous fasting girls; and Sara Baume describing the wild allure and threat of the rural landscape. 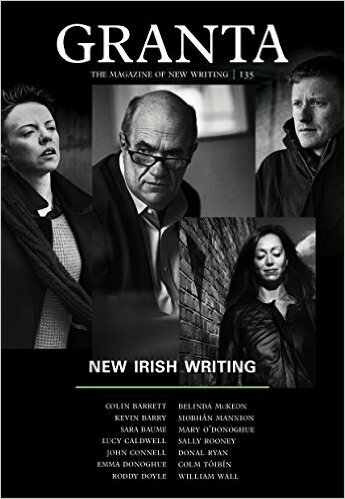 Also featuring fiction from Colin Barrett, John Connell, Mary O’Donoghue, Roddy Doyle, Siobhán Mannion, Belinda McKeon, Sally Rooney, Donal Ryan and William Wall; poetry from Tara Bergin, Leontia Flynn and Stephen Sexton; photography by Doug DuBois, Stephen Dock and Birte Kaufmann; with original portraits of the authors in their environment by acclaimed street photographer Eamonn Doyle.